The data in this graph represents the average annual earnings of workers by education level. These examples include only persons who were 25 years of age or older and the earnings are for full-time wage and salary workers. Source: U.S. Bureau of Labor Statistics, U.S. Department of Labor, Current population survey, 2014. This chart shows a direct correlation between higher education levels and higher average earnings. A worker with a high school diploma earns $34,736. A worker with some college education, but no degree, earns $38,532. A worker with an Associate's degree earns $41,184. A worker with a Bachelor's degree earns $57,252. A worker with a Master's degree earns $68,952. A worker with a Doctorate earns $82,732. 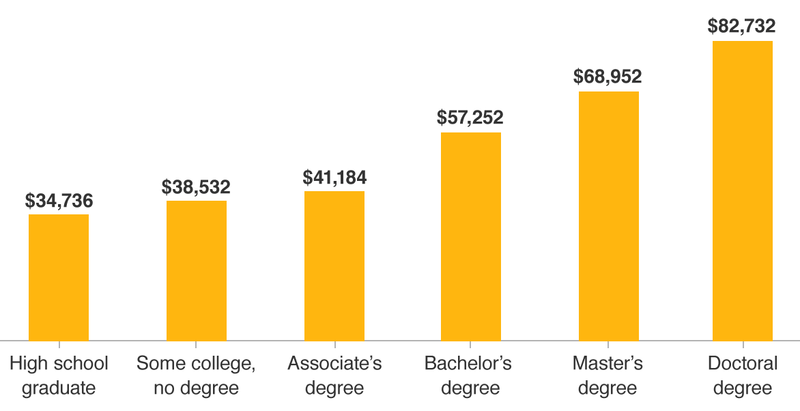 In today's world, a college degree can be worth quite a bit. According to the Bureau of Labor Statistics, in 2014, college graduates earned a salary 60% higher than that of high school graduates. Compound that difference over a 40-year career, and you can see why choosing whether or not to go to college is a critical decision that can have a huge impact on each high school grad's life. Kids are information sponges, naturally curious about the world around them. Take advantage of this and grab every opportunity to help them learn about a variety of topics. If your child's a reader, keep him stocked with library books. If she loves being outside, take her to a farm or on a hike. When you discover something new, share it with your kids—and explain how you learned it and the impact the knowledge will have on you. Of course, you have more fun learning new things when they interest you in the first place. Even if your child's interests veer away from the academic—sports, say, or drama—they're still opportunities for education. Whether he learns about organized sports from the history of the Olympic Games or about Roman government from Shakespeare, the important thing is that he's engaged. These days, you can find interesting, interactive learning experiences on the internet, mobile phones, and social media sites—wherever your child prefers. Whether your child struggles with school or impatiently waits for the beginning of each new academic year, make sure she challenges herself. Model the behavior by making sure to try new things yourself! If you start a new job, begin a new hobby, or just do a great job keeping work and life balanced, talk to your child about the hard work you put into it and the challenges you overcome. Be honest about times you tried your best but things didn't work out as planned—and make sure to let her know what you plan to do differently next time! Some parents offer tangible rewards for effort and good grades, while others believe that hard work is its own reward. No matter which kind of parent you are, every child values praise and recognition for his or her achievements. Studies have shown that kids who have a "growth" mind-set—believing they can become better learners through effort—are more resilient, enjoy learning more, and get better grades. So make sure to acknowledge it when you see your child successfully tackling new challenges. That work ethic will serve him or her well throughout the college years!